24x7 Service Delivery based on ITIL framework. Swan entered into an agreement with India's largest Public Sector Bank to offer VMware Professional Managed Services. The USD 3 million contract is signed for a period of two years. These services are offered on the bank’s private cloud infrastructure, which was originally built by Swan. It takes us immense pleasure in informing you that Mr. Vishwas More from Swan Solutions has been selected in CFO India's 8th Annual CFO100 Roll of Honour! The CFO100 Programme annually recognises the top 100 senior finance professionals in India who have made a difference with their acumen, attitude and leadership. 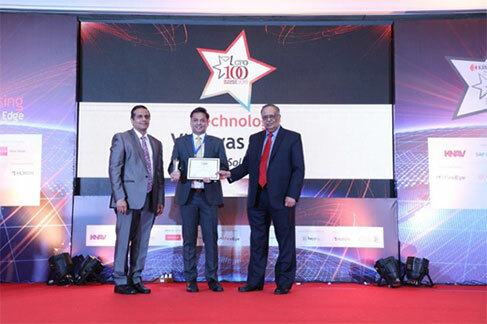 CFO100 Award is a tribute to Vishwas's exceptional contribution to corporate finance in 'Technology' sector. Vishwas was awarded a Trophy & Certificate at the CFO100 Conference and Felicitation Ceremony held on 16 March 2018 at The Leela, Mumbai. 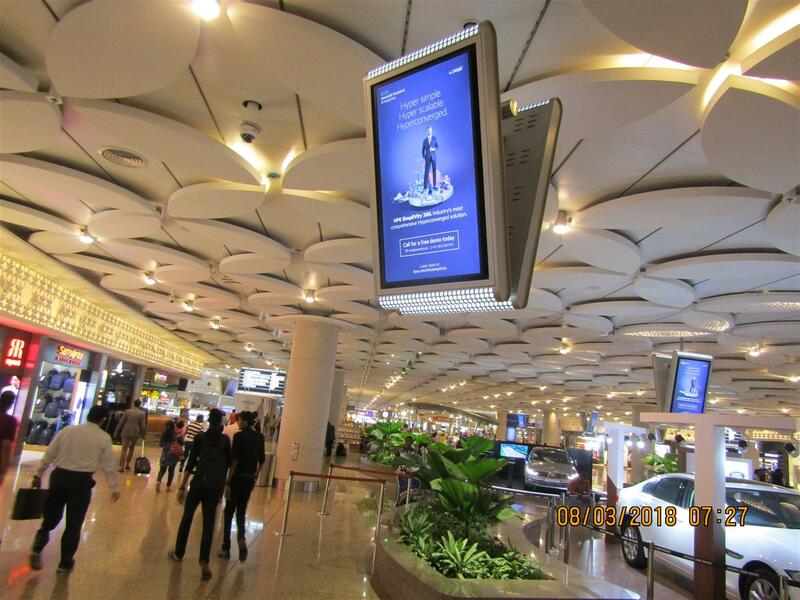 Swan's Video Wall Ad-Campaign on HPE Simplivity Solution is currently Live on the high streets of Mumbai Airport Domestic T2 Terminal. Swan Won HPE 3PAR Upgrade order worth 85L from India's wellknown General Insurance Company. This Customer needed more performance for newer application rollouts and also for their upcoming critical business year end period. Their demand was All-Flash performance and had the liberty to go with any other OEM. But based on existing HPE 3PAR performance and features, customer decided to upgrade the existing 3PAR with additional 80TB of Flash drives. This will help them meet their performance requirement and as well help them to cut down on migration activity in this critical period. Continuing its longs-standing trust in HPE brand, India’s leading and most valuable financial services company in the private sector added 2 Nos. of BLc7000 Chassis & 32 Nos. of BL460 Blade Servers to boost its existing Datacenter. HPE BladeSystem has always helped this customer transform legacy infrastructure and scale business performance while optimizing costs. With the powerful HPE OneView management, BladeSystem puts business on an agile, secure foundation and on the path to a composable experience. Media assets such as video and news footage require durable storage and can grow to many petabytes over time. This was exactly the challenge this Media company was facing. Swan's proposed Solution of Amazon Glacier allowed customer to archive older media content reliably and then move it to Amazon S3 for distribution when needed. Thus, customer can now move all such content around the world with the scalability they are getting on the AWS Cloud. Swan Won a large order worth 99 Lakhs from one of India's most respected Asset Management Company. The Project consisted transformation of client's existing IT Infrastructure from Traditional to HyperConverged. The Solution will bring benefits to the customer in terms of - Reduction in TCO, Single Unified System, Scalable x86 platform, Built-in data protection and recovery, Support for mission-critical applications, Single Vendor Management, etc. The project involves, design, delivery and deployment of Solution including the migration from legacy system. One of India's biggest Public Sector Bank expanded its largest Private Cloud Setup which was based on HPE's Hardware & Vmware VCloud integrated by Swan Solutions. Bank has added additional 12 Chassis & 192 Blades to their existing setup making it one of India's largest Private Cloud deployment. 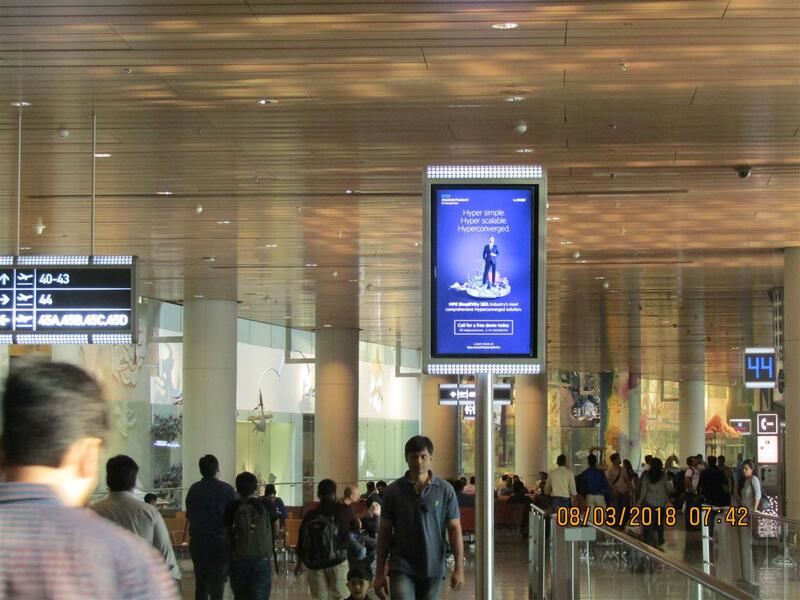 Swan Won a large Network deal worth 50 Lakhs from One of the biggest Media & Entertainment house in India which was coming up with fresh facility for their new Sport Channel. Qualified Network Architects from Swan understood customer’s requirement & designed state-of-the-art Network Architecture. The Solution comprises of 2 high-end Chassis-based Core Switches & multiple Access Switches from HPE Aruba. This new Network infrastructure is specially designed for low latency & high throughput network traffic. 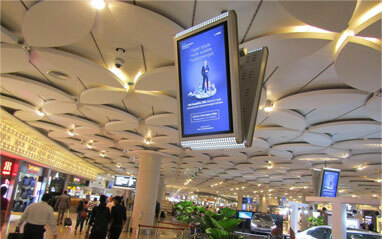 On top of it, this Hybrid Solution is a combination of both Wired & Wireless Network. Swan won a large HPE Synergy deal worth 1.79CR from one of India's leading non-banking finance companies. HPE Synergy is a single infrastructure of physical and virtual pools and a single management interface that allows IT to instantly assemble and re-assemble resources in any configuration. As the foundation for the New Style of Business infrastructure, the HPE Synergy eliminates hardware and operational complexity. It Helps IT to deliver infrastructure to applications faster and with greater precision and flexibility. Swan Won a large deal worth 5.94CR from RailTel for providing Wi-Fi across 47 Railway Stations in India. 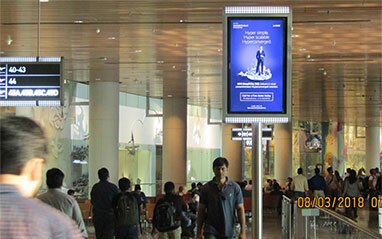 RailTel has taken a lead in providing fast Wi-Fi for the use of passengers at A1, A category Railway stations. The Wi-Fi service shall provide high speed connectivity for viewing uninterrupted high definition videos, download of movies, songs, games by the passengers at Railway station. RailTel roped in Google as the technology partner for setting up fast Wi-Fi network initially covering 400 stations. Once implemented this shall be one of the largest public Wi-Fi project in the World and Swan is elated to be a part of this project. Swan Solutions won a large deal worth 10.10CR from one of its large BFSI client for HPE Storage. Customer was an HPE install base, having all their Core Applications on HP XP24000 storage and there was a Big replacement requirement for this expansion project. The replacement of existing XP24000 Storage happened with new generation Monolithic storage. Existing Storage was configured with 128GB Cache, 24 host ports, Dual DKA high performance model, hosting 300 disks comprising of 146GB x71, 450GB x 91, 300GB x 37, 600GB x 49, 1TBx 18, 2TBx 34, Total 172 TB RAW Capacity at DC & DR respectively. Swan crossed an important billing milestone of 100 Crores in sales for YR 16-17. We achieved a 11% year-over-year growth and most importantly with a 19% growth in our solutions and service business. Our strategy to focus on our strengths in BFSI paid dividends and we are happy to say that we today serve 5 out of the 10 top banks in India. Thank you for trusting us and we solicit your patronage and good wishes for the years to come. It gives us immense pleasure to announce Swan's elevation as 'Platinum Partner' by Hewlett Packard Enterprise. As a Platinum Partner, HPE has recognised Swan's expertise in its technology and investment in our long standing partnership. All these years, Swan has emerged as a leader in HPE technology, firmly supported by our ability to design, consult and implement solutions scaling across medium and large business enterprises. Platinum is the highest level HPE partner designation. And with this cherished title in hand, Swan and HPE together are committed to take you to the next phase of your IT journey. Swan won a large HPE Synergy deal worth 5.94CR from one of the largest public sector Bank in India. HPE Synergy is a single infrastructure of physical and virtual pools and a single management interface that allows IT to instantly assemble and re-assemble resources in any configuration. As the foundation for the New Style of Business infrastructure, the HPE Synergy eliminates hardware and operational complexity. It Helps IT to deliver infrastructure to applications faster and with greater precision and flexibility. Swan Won a large deal worth 6 Crores from one of the Navratna Oil and Gas PSU in India. The solution includes implementation of 2-Tier Backup Solution at the Data Centre & Disaster Recovery Site with implementation and 6 years support. In this Solution, all critical Data will be backed up on the HPE SureStore 6500 Appliance with in-line De-Duplication and Compression at the Data Centre. The De-Dup and Compressed Data will be then replicated to the DR Site and also backed-up on the Tape Library. The solution supports Backup Software’s like HPE Data Protector, IBM Tivoli, EMC Networker etc. Swan won a large deal worth 8.65CR from one of the largest public sector Bank in India. Project is to deploy Aruba ClearPass Policy Manager which will centrally enforce enterprise-grade Mobility and Network Access Control (NAC). With this Solution, granular network access enforcement will be based on a user’s role, device type and role, authentication method, EMM/MDM attributes, device health, location, etc. Hewlett Packard Enterprise awards Swan the Reseller of the Year 2016 Award. Other recipients include TCS, SIFY, WIPRO and VMWare. Swan was chosen for outstanding performances and accomplishments in delivering impactful solutions to its FSI (Financial Service Industry) customers. 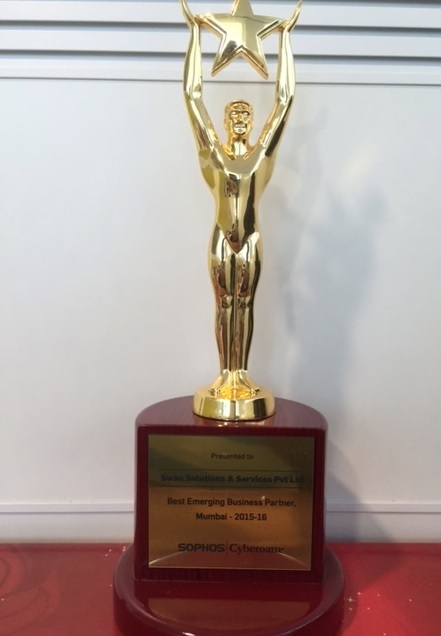 This award is a testimony to the robust partnership between Swan and HPE in delivering best-in-class cloud computing, data center transformation and workspace automation solutions, and addressing the customers’ evolving needs. Swan Solutions, a leading provider of Information Technology solutions successfully inaugurated its first Global Service Delivery Centre (GSDC) on 20th May, 2016 in Mumbai. The center will offer end-to-end services for RIM, Network and Security Monitoring, Application Monitoring and Remediation. Swan Solutions has core expertise in networking, virtualization, and cloud computing. The company offers services around migration, consolidation and system administration expertise on Microsoft platform. The GSDC runs on advanced tools and technologies like PRTG, Nagios and Manage Engine. GSDC has its own DR hosted on cloud to deliver uninterrupted services to its customers. The new GSDC enables Swan Solutions to bid for service contracts within India and international customers in US, Europe and Middle East through its software arm Emqube, Dubai. To run this setup, Swan Solutions is beefing up its support team to staff 90 engineers to work 24×7. Swan already has support presence across the country providing services and support in 700 locations from Port Blair to Kargil and with the new GSDC it can even reach the most remote corner of India as well as any part of the world. Murtuza Sutarwala, Director, Services, Swan Solutions said, “We have been experiencing tremendous growth over the years, by working closely with our customers we have gained an intimate understanding that has helped us identify their challenges. Our GSDC closes the circle allows us to become an end to end support provider. We are pleased to announce the opening of our Global Service Delivery Centre, conveniently located at T-Square, 305, 3rd Floor, Saki Vihar Road, Chandivali, Andheri (E), Mumbai 400072. Swan can now offer to a global clientele a host of services to ensure business continuity, network security, and IT asset optimization through a 30 seater 24x7 state-of-the-art future ready operations centre. We invite you to visit our new facilities anytime convenient to you. Come to mark our new milestone. Come to witness the future of tomorrow! Swan Solutions in partnership with HP has recently bagged an order to deploy a pan-India Print Management Solution across 700 branches for one of its large BFSI clientele. This involved replacing all the legacy devices with equivalent or better features, environmental friendly devices, deployment of the remote management application managed by centralized helpdesk for proactive management of break-downs and supplies replenishment. Invoicing of the usage is based on consumption at the end of the month for individual locations without the users and procurement team having to raise new request and follow-up for the same. This will lead to immense end user satisfaction for the device management and overall cost reduction. The bank will deliver Infrastructure as a Service (IaaS) to its internal departments. Hitherto the bank was following a long and circuitous manual process for virtualization requests which the new software will completely automate, thus cutting down the implementation cycle time and effort. With the new VMWare Private Cloud software in place, the bank plans to implement virtual machines within couple hours as compared to the earlier manual process that took over 2 weeks.